Tupperware parties were a thing of the 1960s and 1970s, and I fondly remember being taken along to these parties by my mother. She never held one of her own, but in those days it was very exciting to be taken to someone’s house and introduced to all this plastic kitchenware. I guess today it’s a bit like taking a trip round Lakeland with your girly pals, and having drinks and nibbles thrown in. It went without saying that you had to buy something, that was the point of being invited. And so it came to pass that my Mum bought the jug. 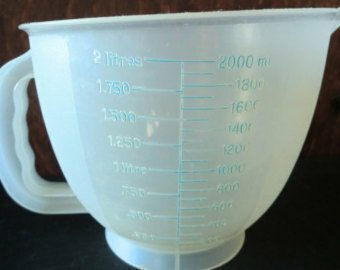 Pictured below (I found the photos online), it is a giant jug, with a fitted plastic lid. And so, having bought the jug, Mum needed to find something to use it for. Which is when concentrated frozen orange juice appeared in my life. 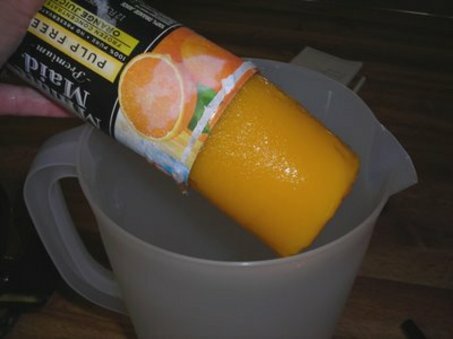 This block of iced orange would be placed in the jug and lots of water added to it, to dilute it. 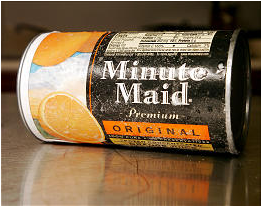 You put the lid on, kept it in the fridge and had a glass every morning. It had a very different taste from the orange squash I was used to, but Mum bought into the idea that because it was ‘real’ oranges it must be really good for you. I got used to this juice, and quite enjoyed it. 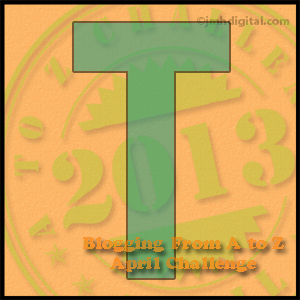 This entry was posted in A - Z Blogging Challenge 2013, Enid May Howells and tagged History. Bookmark the permalink. I actually still have some of my Tupperware from 1979 when I ripped for a while. Love the stuff! Linda – I still have some bits too! It must have been good stuff, it lasts forever.